Hey, Remember Jim Edmonds on the Padres? Hey remember the old days when our awesome general manager at the time traded promising 3B prospect David Freese for less than 2 months of sub-mediocre performance by Jim Edmonds? Then we cut Edmonds, he signed back with the Cardinals, and played about a billion times better than he did here. 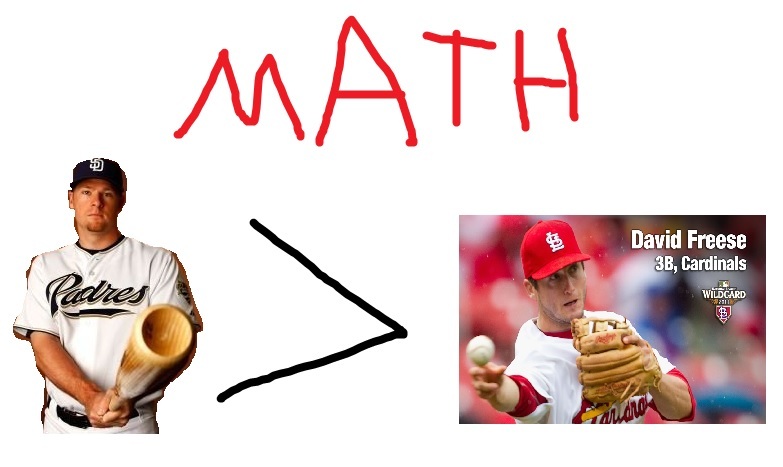 Freese played some solid 3B with a lot of clutch hitting into the playoffs. Meanwhile, the Padres were stuck with no power, mediocre fielding Chase Headley who would go on to hit 4 home runs. I still remember all the complaining and blame gaming about how we could let a bonafide 3B go for basically nothing while we were stuck with a former prospect that will never pan out. REMEMBER THOSE DAYS?!?!?! With mathematical analysis like that, it’s pretty much an indisputable fact. Like there are postulates that can be used in a proof that PROVE this analysis. I’m glad we have Chase Headley on this team. Also, Jim Edmonds was the worst. Jim Edmonds made Adam Hyzdu look like a productive outfielder in comparison. ← Gio Gonzalez? More like Gio Dongzalez! Amirite?!? !